Spring Break Code-a-Thon for Missions: Use your tech skills at this hackathon for Jesus' Kingdom. 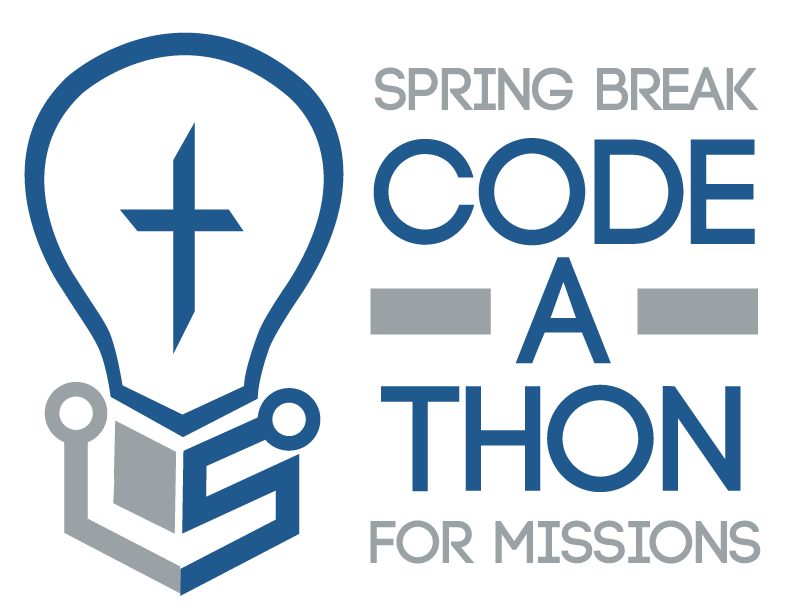 Our Eighth Annual Spring Break Code-a-Thon for Missions is coming up in March of 2019! Code-a-Thon is a time where Christian software developers, designers, project managers, and tech writers can gather weeklong for coding, fellowship, prayer, worship, learning about missions, and fun. We'll look forward to hopefully seeing you at LightSys in beautiful Colorado Springs, Colorado this coming March! Registration for Code-a-Thon 2019 has closed; please contact LightSys for more information. Bookmark this page for future updates on Code-a-Thon 2020! I'm interested in coming! Get a team (or teams) together! We recommend coming as a group of at least three people, but individuals and those in smaller groups are welcome and we'll likely join such groups with other groups when forming teams. Is this open to non-programmers? Yes! We need graphics designers, project managers, and tech writers, to be a part of the event, too, but we specifically do need programmers on all of the project teams. Will I have time to go skiing or hiking? Yes (weather permitting)! We give one day off during the week for you to go have fun outdoors. Will LightSys have Code-a-Thon during my Spring Break week? We're offering Code-a-Thon during the weeks of March 3-8 2019, March 10-15 2019, March 17-22 2019, and March 24-29 2019. If your spring break is during a different week, and you're interested in attending, let us know so we can consider offering the event a different week as well. I'm not sure I'm experienced enough in programming (or a related field) yet. We'll have professional software developers who help us review our project proposals, and many of them are willing to help you better understand the design, scope, and nuances, of your project. Is this a Hackathon? Yes! We just use the term Code-a-Thon so that your non-tech friends and family can better understand the name of the event (i.e., we're not unlawfully breaking into computers! ), though just between us, yes you can call it a Hackathon. :) It does, however, differ from a traditional hackathon by having a different schedule and timbre, with a spiritually immersive environment and a longer schedule that provides about 35 hours of actual programming time. What's the Cost? Code-a-Thon is free, except that we do request that you raise some support for the event so that you can be a part. If you're covering your own transportation costs, tentatively this will be $70 per person, or $160 per person if we're reimbursing part of your airfare or all of your gasoline receipts. Donors can send support to LightSys, for the Code-a-Thon fund, and donations are tax-deductible. You also may want to have some spending money to do fun things on your day off. Is this just for students? Anyone can come who wants to use their skills to further Jesus' kingdom around the world! We are specifically holding this event over Spring Break so that university students can come, since weekend events are harder for students, but the event is not limited to students. Come join us! Interested in information about Code-a-Thon as well as about internships, our gap year program, full-time work with LightSys, volunteering, helping to review project proposals and mentor participants, or other ways of helping in missions with LightSys? Help us start to get to know you at: http://LightSys.org/start. Or, check out more ways you can get involved!